This is the best wood fired pizza you've ever had. Doug makes his pizza crust from scratch using a carefully maintained 15-year-old sourdough starter. He allows the dough to ferment for 2 days, the traditional way. Each personal-sized pie is topped with his homemade signature sauce, a variety of local Hudson Valley roasted vegetables, grass-fed meat and high quality cheeses. An experience your guests will not forget. Itsa Pizza's mobile wood-fired pizza truck caters to NYC, Westchester, the Hudson Valley & beyond. Itsa Pizza is all about fresh-out-of-the-oven farm-to-table small batch deliciousness. Our offerings change seasonally based on what's available from local Hudson Valley farms. We buy organic produce whenever possible and source our grass-fed meats and sausages from Fleishers Craft Butchery in Kingston, NY. We're excited to help support the local food system while also paying homage to slow food with our 2-day wild fermented sourdough pizza. 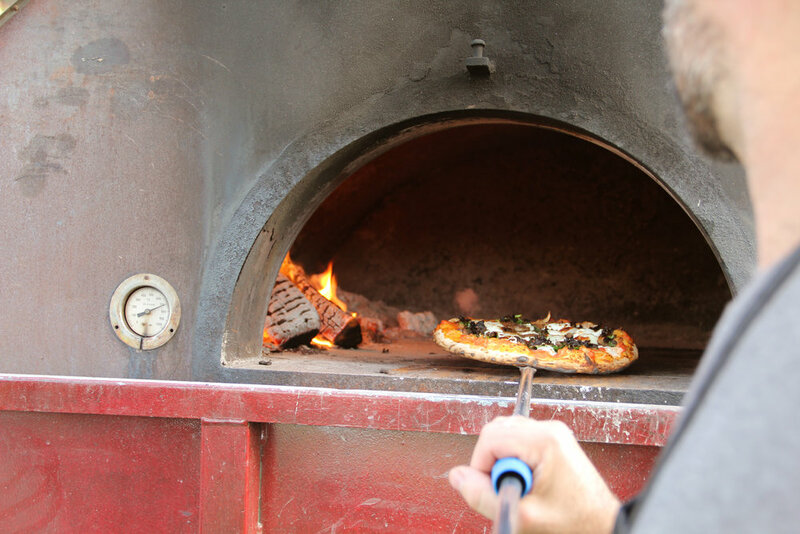 It is our joy to bring you the freshest, most delicious, crispy, chewy, consciously-sourced, mobile crackling wood fired pizza you've ever had! Our pizza dough is made of wheat flour. However, it's wild fermented sourdough pizza. That means we use a natural starter made of flour, water, and a complex community of wild yeasts from the air around us, instead of monoculture commercial yeast. It takes a lot longer this way, but it world's beyond in terms of flavor and digestibility. By making naturally leavened pizza dough, and letting it slowly and fully ferment, we're crafting a pizza that is far more digestible than standard bread products. If you have a gluten sensitivity, we still encourage you to give our pizza a try- you're very likely to find it easier on the belly! We continuously bake a selection of 3 artisanal pizzas, serving them by the slice over a 2 hour period. All packages include an endless salad of local Hudson Valley greens and homemade dressing. With packages starting at $1200 for up to 50 guests, this is by far the most affordable wedding catering option around! 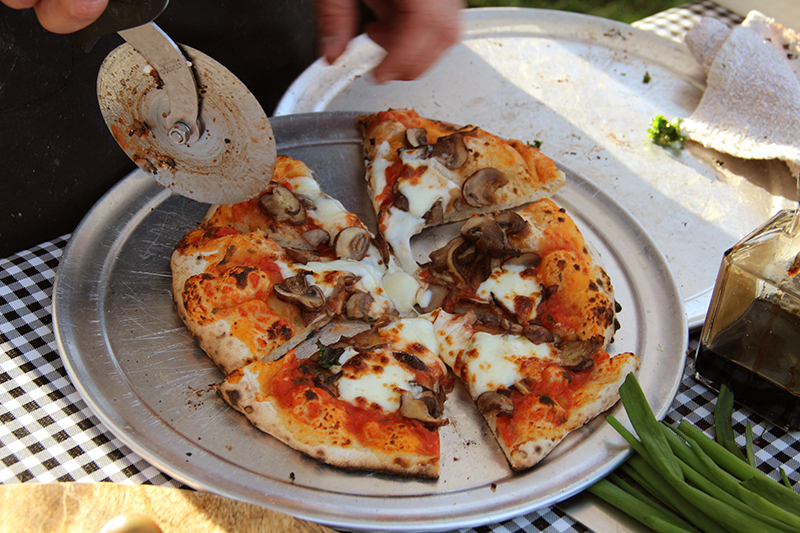 "Itsa Pizza Truck created fabulous food for our recent party of 40 at the Mohonk Preserve. Doug and his assistant cooked an array or delicious and gorgeous artisan wood fired pizzas for our guests. We loved the local ingredients, great salad, and most of all enjoyed watching Doug cook our meal in his traveling oven. Doug was a pleasure to work with and we hope to have him cater many more parties in the future. Our guests would agree!" "Doug and team catered our rehearsal dinner for 110 people in New Paltz. Guests are still talking about how good the pizza was...and this coming from true New Yorkers! Not only was the food amazing, but the service was fast and friendly. Would highly recommend Itsa Pizza for any event!"